Elephant Games proudly presents another moving story in their classic series Grim Tales! 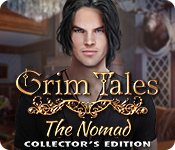 Grim Tales: The Nomad Collector's Edition is rated 3.7 out of 5 by 27. Rated 5 out of 5 by Tomsde from The Grays Are Always Finding Lost Relatives. I love the Grim Tales series. I enjoyed this installment as well along with it's high standards of artwork, music and effects. It's not a scary story by comparison with some of the others, but i'ts very good. If I were to have any complaints at all it's that it was too short. The bonus chapter is definitely worth paying for the Collector's Edition. Rated 5 out of 5 by Robcol from Excellent! This is a super game. One of the best yet. Rated 5 out of 5 by RPgames from Greys are coming Very good game. I do like this series of games. Mystery and a bit of sleuthing. Not spooky unless you get the willeys real easy. One does look around for items so if you don't like this this game is not for you. There are parts that are a little dark but I feel it makes it harder to find items. To me it was not a short game but I have it with hints and skips only so I do search around more than most people I guess. The story line was good I thought a little different but not really a game changer. Bonus chapter was ok with more searching. A extra bonus was searching for items that change in 4 of the scene's which was a good bonus I thought. If you like this series I recommend the game other wise try the trial game first. Rated 5 out of 5 by Marja67 from Good Game. I enjoyed this. Need 5 star games to play. Pretty graphics. Good music. Good story. Rated 5 out of 5 by Majestyx12 from The Outcasts with a much improved Life Based on the finished game with bonus material. I play as Anna. My sister who works at a Museum calls for my help with a thieve. My special ability is going back in the past. I find a bunch of confused kids that have special powers. The story unfolds. I liked the morphs, collectible statutes and puzzle pieces. The Archive has replays on 13 hops and 13 mini-games. The secret room has 61 morphs to find in four different rooms. I thought the morphs were perfectly timed for my enjoyment. I would have liked to retrieve a missed item but I could not. I liked most of the puzzles. Especially the jigsaw, follow what is played in that order, paint by number. They are fun. It has six chapters + bonus. It didn't seem short to me. It took the normal amount of time for me but I like looking around and just enjoying. I don't get in a hurry. I would have liked to have a moving screensaver of the moving Dinosaurs but you have 3 plain one's instead. I would have liked to have wallpapers of the dinosaurs from the main game. From the bonus chapter, the Weeping willow tree. I know the makers are proud of their characters but I would have preferred these without anything else. I've been saying this for years. I also would have preferred that the guide had the finished product picture of a mini-game with instructions. It had one mini-game that you had to place four items next to the picture of the four items. I placed them on the outside area. The finished product if you enter all the letters put you on the inside. I could have put them on the inside if I knew that is what was wanted if I seen the finished product picture. I just skipped it after I had them on the outside by their pictures. Also the lock didn't have a picture in the guide but they wanted the number only in the center and not on one end. I could have used a picture for that. My favorites from this series is The White Lady, Graywitch and The Time Traveler. Rated 5 out of 5 by biscuitsmama from ANNA AND RICHARD RETURN IN AN EXCELLENT NEW GRIM TALES Anna Gray and the Grim Tales series return with game sixteen – The Nomad. This long-standing favorite series with many gamers is also one with which I happen to have a love-hate relationship. Some of the earlier games had a tendency to be what some might consider a bit gritty but the later games have been far more to my liking. The Nomad happens to fall on the “love” side of the scale for me. From the moment I began playing I found myself involved in what I consider to be one of the better stories of the series. I generally am fairly outspoken about the lack of a “true custom mode” in games and this one does not allow the gamer to set their preference for the Hint and Skip times in a game. I happen to believe that customization should offer an open-ended scale for those times. 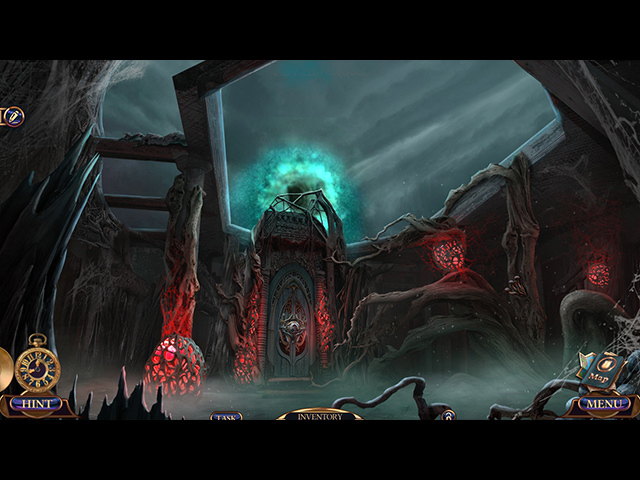 There is no need to recap the story as you can find that information on the game’s home page and when you play the demo. I enjoyed the storyline in the game and it is very well told as you progress with the gameplay. 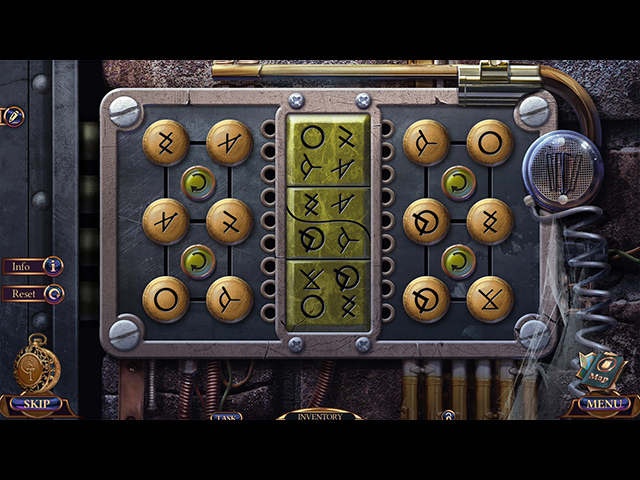 When the game begins we have the general task to find items that we need to open either HOP scenes or Puzzles. Although the presentation of the HOPS might not be for everyone, I loved them and enjoyed finding the items, even the ones that were well-concealed. There is some variety in the HOPS but most are presented in the list find style that I enjoy the most. As much as I enjoyed the HOPS, I found the Puzzles to be even better. The puzzles might seem easy but they are still excellent and include many of my old-time favorites beginning with the one where we need to move the tiles to open a lock. This particular puzzle is easier than it has been in other games but I still enjoyed it. Of course The Nomad wouldn’t be a game from this developer if we didn’t find a missing zipper pull. Whenever I come across the missing zipper pull I have to chuckle because I know so many gamers hate having to open a case where one is missing. With several of the last Grim Tales games we have the addition of Anna’s deceased father Richard whose skull is tagging along to help Anna solve each case. I don’t know many people who have an attachment to carting dad’s skull everywhere they go but Richard does add levity to the game. It took me a few games to get used to Richard but he has definitely grown on me and I think he is a needed element in the game. Some might think of Richard as a gimmick but he does provide some help when needed without being too intrusive. The game has six chapters and I actually consider it to be a long game but that is because I don’t rush to see how fast I can get to the finish line. For me the enjoyment of playing is seeing every little detail in each scene and reading all of the news clippings or slips of paper that are found. CE games are my favorite since I love finding all of the collectibles and morphing objects. Yes many of the items are easy to find but not all of them jump right out at me. Another thing that I enjoy about The Nomad is that there is backtracking between the scenes. I don’t particularly care to pick up a hammer and then glance at the wall and find a nail that I should remove from a board immediately upon finding the hammer or any other tool. I love having a large inventory and then having to remember where I might need to use one of the items. Some might consider this to be a time-filler but I think it makes for a better game and is no more of a time-filler than having to play a puzzle in order to use an item. Grim Tales: The Nomad is a wonderful game and perfect for the way I like to play. I purchased the game almost immediately and have had no regrets. The gameplay is entertaining and the storyline is excellent. I own every Grim Tales game since the series began with The Bride, and I often replay some of them each year. Even though Grim Tales: The Nomad is one I enjoy, please try the demo to see is it is a game that you will enjoy as well. Happy gaming! Rated 5 out of 5 by margann1952 from LOVE ANNA GRAY I only played this game for about fifteen minutes, although I don't know why I did that. I knew from the start that I was going to purchase it anyway. This is one of my top five game series and I have the whole collection. Grim Tales has always been an outstanding series, from the storylines, audio/visual, graphics,mini games and HOS, that has always left me wanting more. Thank you Grim Tales and keep them coming. Rated 4 out of 5 by pip_1972 from Just as I was getting into it. I was really enjoying this game and then it seemed to end abruptly. Granted there was the bonus game and secret room but I do like a longer game especially from collector's editions. Rated 4 out of 5 by timothya from Not So Grim Tale - Short And Sweet The latest entry in a favorite series. Anna Gray's troublesome family has managed to spin into a gang of delinquent artifact thieves and it's up to her to sort things out. As always, she does not fight alone, although you might suspect that carrying around the skull of her dead father has to limit her travel options somewhat. And her father Richard, one of my favorite characters in any genre, is his usual wonderful, snarky, irritating, occasionally helpful when he feels like it, Dad-like self. Pros: excellent graphics, high production values. The interiors are lush and colorful, the music atmospheric without being cloying. Voice acting adequate except for Anna's father, who is outstanding. HO scenes are a nice mixture, puzzles are on the easy side but still with a couple of intriguing wrinkles. Cons: The plot is all discovery and the resolution feels a bit rushed. Well, really rushed, it's a short game. We must travel into the past of certain characters to prevent a critical event, a sort of one-scene Redemption Cemetery that could have been extended just a bit in each case to make a better balanced game. A bit more of an explanation of the Gray family relationships earlier in the game might have prevented a lot of confusion for players who aren't familiar with the series. Overall, a lot of fun in this one. When Anna's father turned up in a cheesy helmet demanding a superhero name I almost fell off my chair. We aren't out to save the world from some hideous cosmic fate this time, and the game is oh so much better for that. It is actually the Bonus Game that puts closure on the thing, for the remaining relative has some skeletons in his closet as well, ahich Anna's father, his grandfather, helps him to erase. It's a Gray family affair, after all. Rated 4 out of 5 by judy76073 from enjoyed the game! 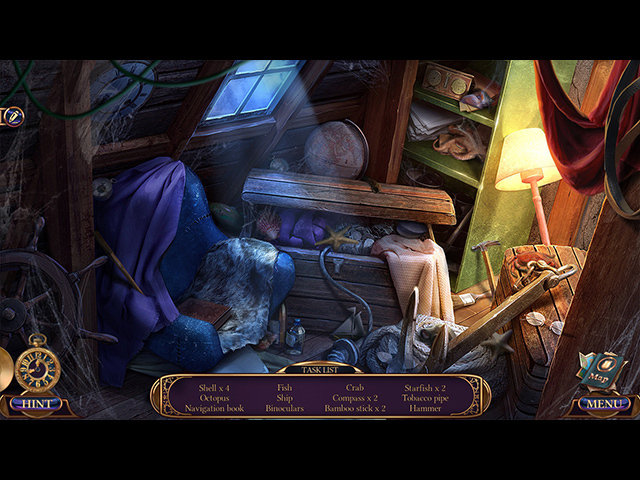 well, I quite enjoyed the game - I have all of the Grim Tales games. My only "complaint" - I missed a couple of the collectibles - and could not go back and collect the few that I missed in the "extras" section (once I completed the main & bonus games).